I said 'goodbye' to all my Pittsburgh friends Sunday September 7th at a get-together at my Pittsburgh host family's house. It was hard to say goodbye to all the people that have made Pittsburgh my home over the past four years and I know I will miss all the little things about life there. My last few days were a montage of my favorite burgh activities, like spending Saturday in the Strip District, contra dancing and hanging out on the Southside. It was a lovely distraction to be able to share these things with some wonderful friends from Germany who were visiting Pittsburgh. I was also pleasantly surprised when I showed up for my last day of work and found my boss had made his own powerpoint version of "Turkmenistan Jeopardy" for me and coworkers to compete in. Thankfully, the questions were from Wikipedia so I didn't have to be embarrassed and my coworkers got to learn a bit about where I'll be. The last couple of days were spent packing and cleaning up both my place and Michael's place as we loaded our good friends down with all our good junk that we just couldn't fit in our parents' attics. After we finally loaded our Penske truck, we drove across the city, tearfully saying our goodbyes to our favorite bridges. Back in Fleetwood, PA, I'm enjoying sleeping in, reading and visiting family, while I run errands and get all my finances and other things in order. This Sunday September 21st will be Part II of my Farewell Party to be held in the Fleetwood Community Park and the start of my last week in the States. I'm looking forward to seeing everyone here and spending my last few days enjoying hot showers, carrot cake, and using my debit card among other little luxuries. Hi Mary! 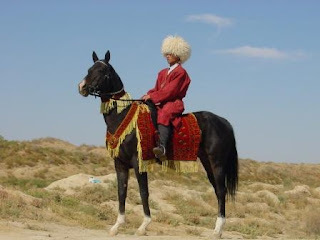 I'm leaving for Turkmenistan in two and a half days too! If you get a chance send me an email or check out my blog. Otherwise see you in Philly!